Contact via Skype: franky1z or Email: fzander@hotmail.de if you have any questions ! Push Service with one signal is also integrated ! You can send news/offers directly via push service. All news or offers are stored in a database and your customer will get a notification. Our new version 2.0 is kept very modern and also helps you to become independent. There is a slide menu integrated with the categories and a shopping cart . Also there is an About Us page. The start screen (Splash Screen) is optional. 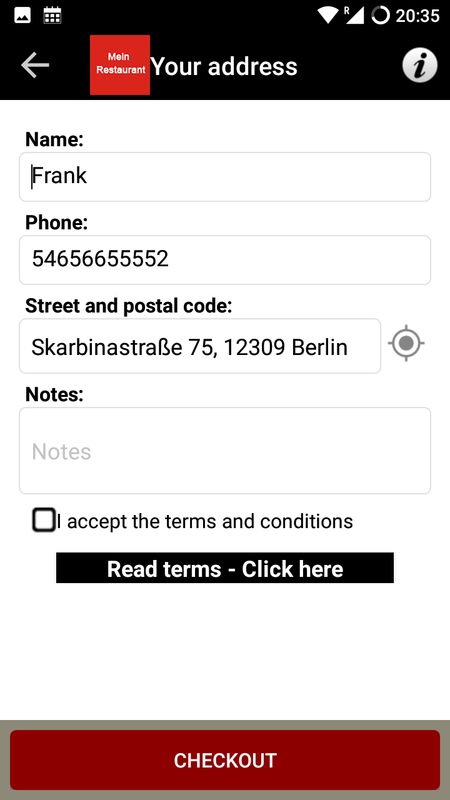 Furthermore, your customer can write a comment in notes and choose the delivery method when ordering. Your customer can choose between pick up or delivery. We will create your own food delivery App for you. The APP is suitable for beverage delivery service, pizza delivery service and other restaurants services, which offer a takeaway service and a pick up service. 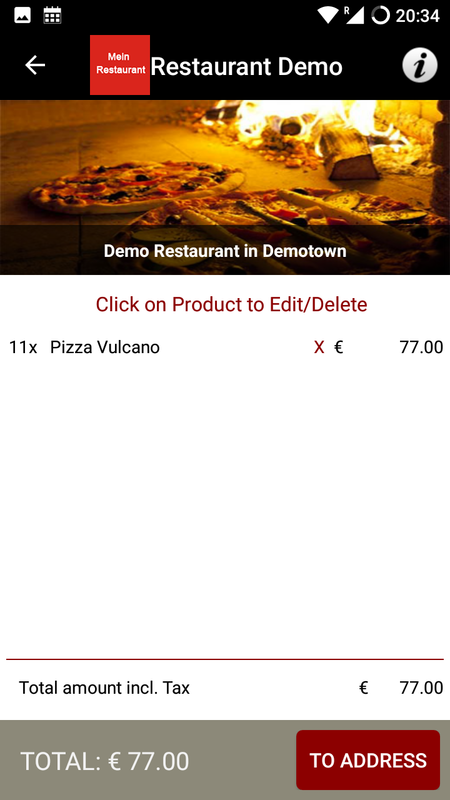 You can easily promote this Android APP (most people have Android mobile phones) in your Restaurant or Pizzeria with a QR-Code to scan (on flyers too), so that customers can install your takeaway APP on their mobile phones. 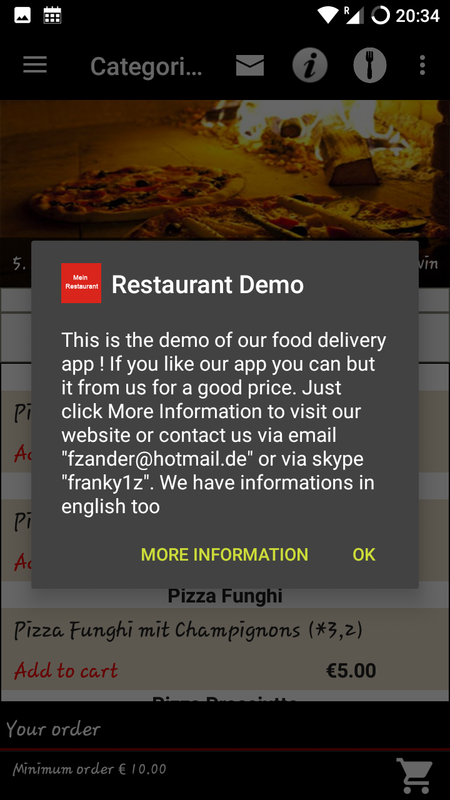 Just tell your existing customers that you now have your „own food delivery App“. Simply scan the QR code, to test our Demo APP on Google Play. The customer selects the food easily from different categories, enters his address (which will be saved) and then at checkout he gets an overview of the entire order with the unit prices and the total price incl. VAT. The link to our takeaway APP on Google Play can be found here: Order Demo Food Delivery App . You can also just search for „Order Demo“in the Play Store. Your customer can order via SMS, email or WhatsApp. If desired individual buttons can also be disabled. 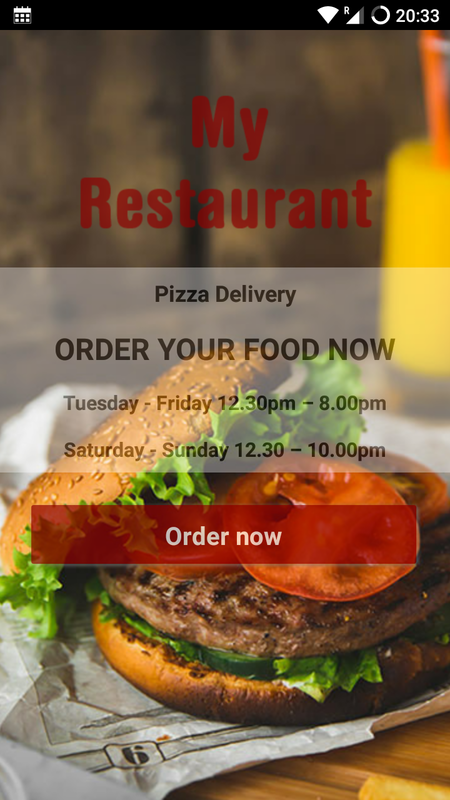 The big advantage of the food delivery APP is that the customer can order via SMS and therefore no mobile internet is needed on the mobile phone. After receiving the order from your customer you can send a confirmation when the food is delivered. The Android app also has an About Us page. All products and images themselves are integrated into the ordering app, so you do not even need a a hosting service. It is recommended to have max. number of 80 – 90 products and also to integrate many products that sell best. 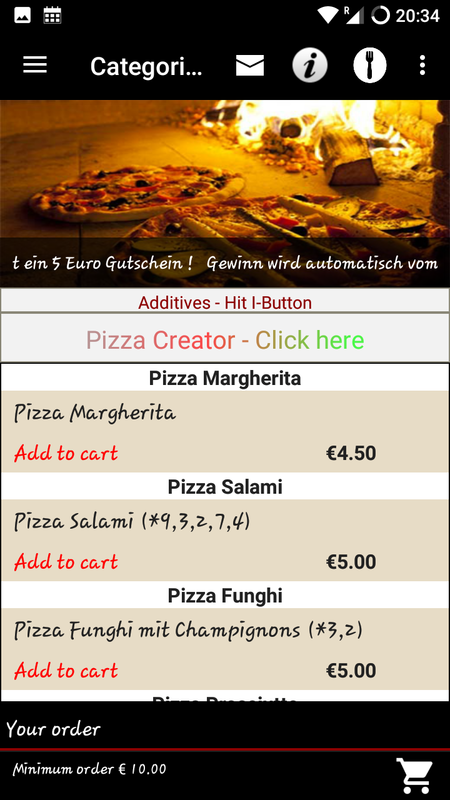 It´s also possible to create a category „Extras“, where the customer can order extra cheese, extra pepperoni for extra charge. Also it is possible to make categories such as Pizza small, medium or large. The design of the APP (start screen ) can of course be changed as well as the other texts. 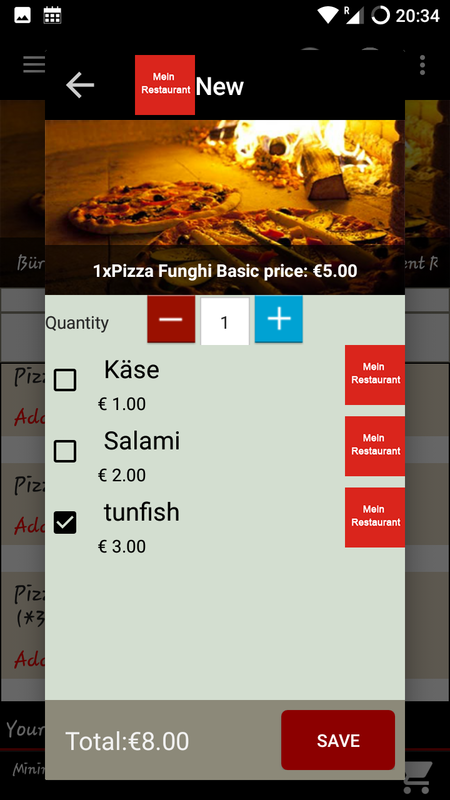 Our food ordering APP for Android is compatible with many mobile from Android 3.0 up to the new Android Lollipop. More than 10000 smartphones incl. tablets are compatible with our APP. The advantage of this app is obvious: 100% revenue + tip remain with you, because you have no agent in between. Thus, you can make a lot sales with your delivery service and also you can inform existing regular customers that you now have a your own food delivery APP. If your customers are satisfied with your food / take away service, then they will in the future certainly order on your app . This offer is only valid for customers outsite from Germany and Austria !!! Currently we charge only 399, – $ incl. 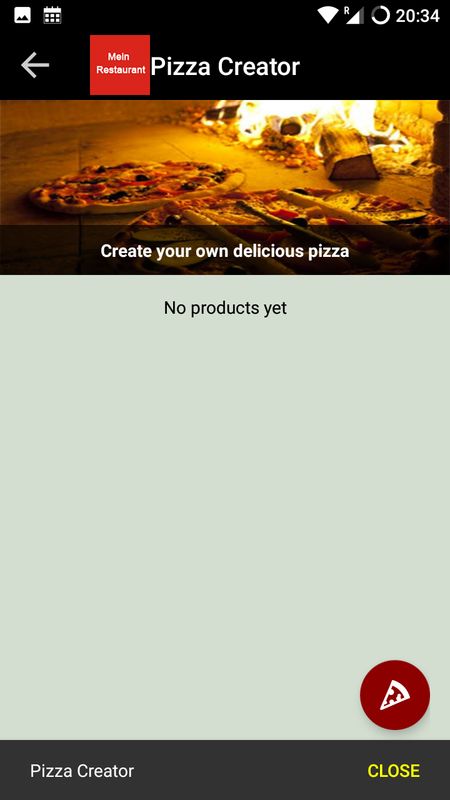 TAX for a short time for creating your own Android food delivery APP !! Push Service included ! For the calculation of extras/pizza creator etc. contact us ! (Normally the price is 899 $). Each APP is individually created and the category adjusted accordingly with products. The price is of course only „unique“ to. Since the app works independently of the Internet, you will save not only its own website, but also a Web server and other monthly costs !!! New SMS Manager for incoming orders ! Automatic confirmation of incoming order. Configurable in settings. Your customer will receive a message that his food will be delivered in approx. 30-40 minutes. 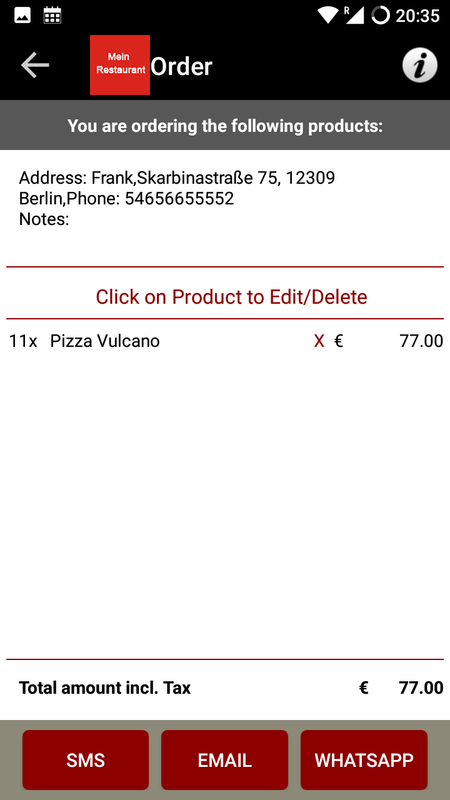 If you receive a new order the app will open automatically and show you the newest food order. Also you can save all oders in a textfile and send them to an existing email address to print them later. It is also possible to copy a single order to the clipboard and an (pushing the share button) send it to an existing email address too. The App must be paid in advance with bank transfer ! A refund can not be done if we have already started with our work. Product images (Should be one picture for every category). It is also possible to use for all categories only one picture. However, make sure „you“ have the rights of the images. Otherwise, you must make sure that you use „royalty free“ images! Company description incl. mobile number, address and tax identification number for the About Us page. We insert texts and prices for the products and your company name / other data. 80 – 90 products maximum! Take only items that sell best and not overwhelm your customers with „lots of“ categories and products. An update service for prices / products (mostly once a year) costs approximately $ 80-100 depending on the effort. If you have any questions feel free to contact us ! We will answer you shortly !